You are here: Home / Shop / Cat Stuff for Humans / Celebrate April 15 With My Accountant Kitty Merch! Celebrate April 15 With My Accountant Kitty Merch! 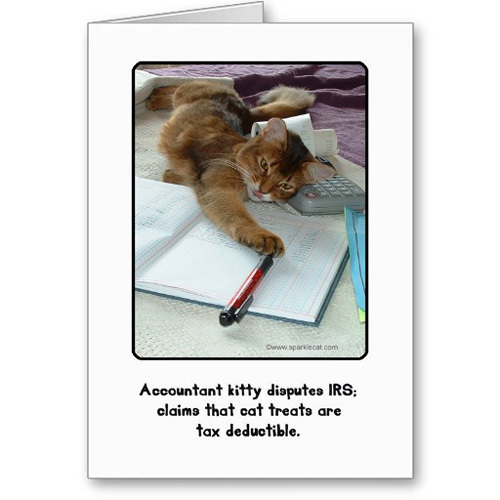 Tax season is over celebrate with one of my Accountant Kitty items! Even better, if you shop today, April 15, you will get 10.40% off until 11:59 Pacific Time! Use code TAXDAYDEALIO at checkout in the “Zazzle Coupons/Gift Certificates” box! Thank your accountant or favorite number cruncher with a greeting card! If they got you a refund, give them a mug! 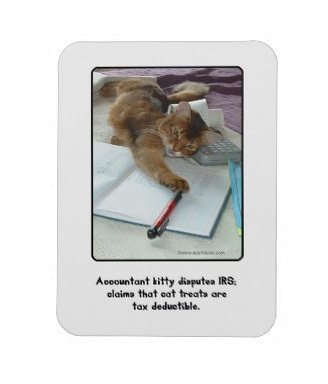 Or my newest item — an Accountant Kitty magnet! I just gave one of these away to a lucky subscriber to my monthly newsletter! 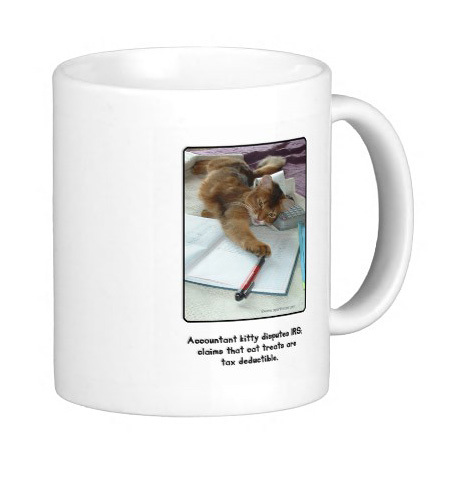 See these and other cool kitty items at my Zazzle Designer Cat Shop! Tee! Hee! Mommy was at the accountant today! Yep she finally gots all the pieces of paper put in the right places and the spreadsheets filled out and all the bits and bobs from everywhere! These items make paying taxes just a little bit better! Great items! Our mom was going to buy some things for us with her refund, but that old heat/ac unit decided to break! We agree Sparkle. Anything for kitties should be tax deductible!!! Dang paw slip…ready to file! We aren’t read to file our treat taxes yet! And good luck today with the contest. We voted for you! Wonder if anyone will get one of your goodies for our mommy. She’s really liking that magnet! That’s such a great idea! I ought to tell the humans cat treats are deductible!! Of course all of our treats, litter, food, toys…you name it should be tax deductible. Its a work related expense for mom and dad…I mean they couldn’t work…even function if it weren’t for us. We didn’t know treats were tax free – we’ll get Mum to check if that’s so in the UK too. Oh for sure we will check out the Zazzle site. Hope you have a great day. Oh what a cute picture! Yes kitty treats are tax deductible! Oh no – tax time is such a pain. Better send your mom to bed. Love the merch! Who would question the deductibility of cat treats?!?! Of course cat treats are tax deductable – we wouldn’t be able to have them if not.